If you haven’t yet created a DraftKings account be sure to use our Promo Code RotoGrinders to get 3 months of our DraftKings premium product for free! ($75 value). With perhaps the top blend of heads-up and tournament action, DraftKings is a popular destination for daily fantasy baseball players of all skill levels. DraftKings baseball strategy is a little bit different from that on other sites because they have some unique starting requirements and scoring. Typically, starting requirements and scoring systems that differ from the norm favor the best players who put in the most research time. Just like the flex position or 0.5 PPR scoring in football, slight alterations in daily fantasy baseball can drastically alter the preferred strategy. 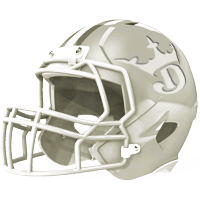 Note that the content below is intended for novice daily fantasy players. 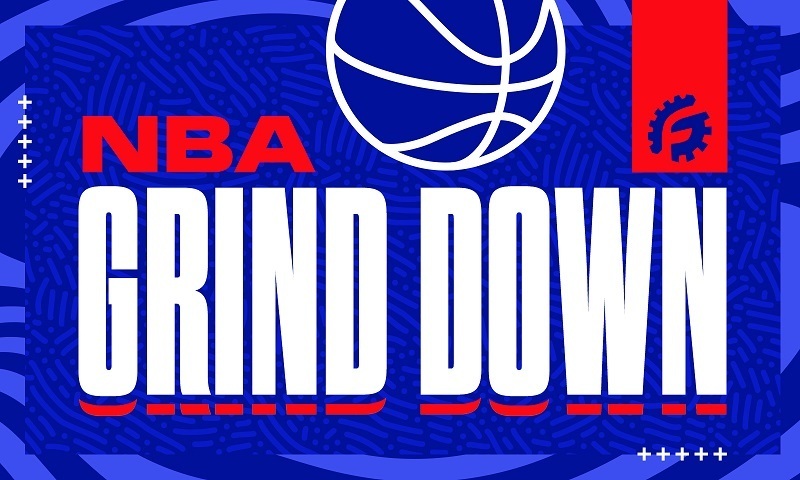 If you have daily fantasy experience, be sure to check out our more intermediate and advanced material at GrindersU. The sport-specific sections are split into Undergrad, Masters, and PhD sub-categories. 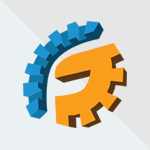 There, we walk you through topics such as building a research foundation, using the Vegas lines to help you pick players, understanding game variance, and the best approach for winning tournaments. Just sort through the drop-down menus on the left side of GrindersU to take advantage of all of the free, in-depth content. 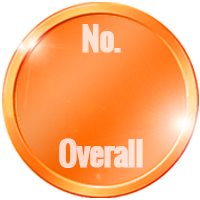 For a general overview of all that DraftKings offers, check out our DraftKings Review. Now let’s break down exactly how you should tackle DraftKings MLB strategy. On DraftKings, daily fantasy baseball players are required to start two pitchers, one catcher, one first baseman/DH, one second baseman, one third baseman, one shortstop, and three outfielders. The obvious starting requirement that sticks out is the two pitchers, as many sites require you to start only one. This not only has an impact on the importance of pitchers, but it also changes how you can and should address your hitters. Whereas you can easily start an elite pitcher and multiple top-tier hitters on a site like FanDuel, it’s much more difficult to load your team with top hitters if you have two aces in your lineup. Similarly, you can really stack your team with sluggers if you go low at both pitcher spots. DraftKings compensates for the extra starter by providing more cap room (or, more technically, giving each player a salary that’s a slightly lower percentage of the total cap), so having two pitchers allows for more room at the other positions if you scrape the bottom of the pitcher barrel. 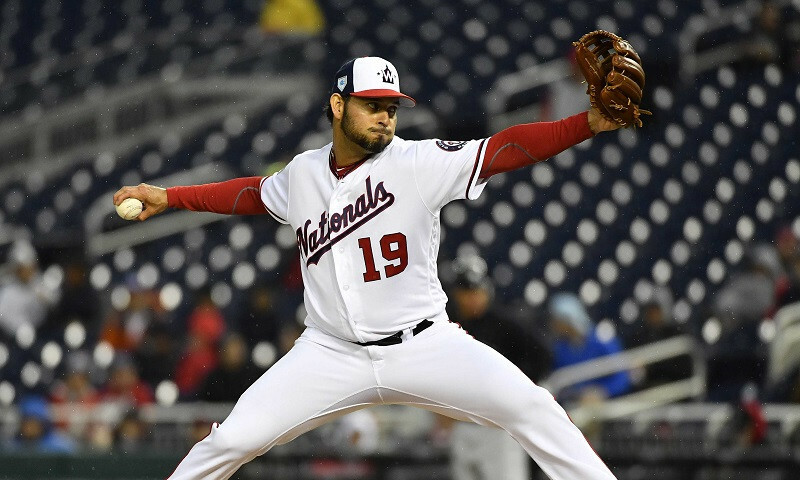 The importance of pitching on DraftKings is even greater when you consider the scoring system. 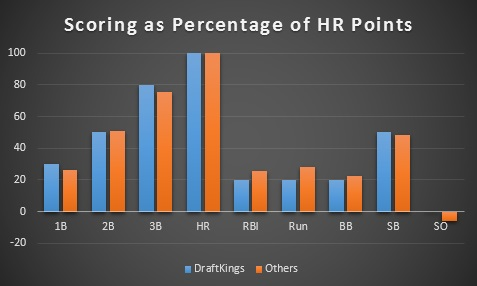 DraftKings’ scoring differs greatly from other sites in regards to bulk points; while most sites award four points for a home run, for example, DraftKings is all the way up at 10. Those pure points don’t matter, though; rather, it’s the relationship between each category. If the site were to award 20 points for a home run and 16 points for a triple instead of 10 and 8, respectively, the relationship between the two stats would remain intact, and thus they’d be “worth” the same in both situations. Before diving into the pitching, let’s look at how the hitting stats at DraftKings compare to other sites. I sorted every stat in terms of how the points awarded compare with those for a home run. There aren’t any major differences here, with DraftKings awarding a greater percentage of points for singles, triples, and steals, with a slightly power percentage of points for doubles, RBIs, runs, and walks. Also note that DraftKings does not penalize batters for strikeouts. That has obvious ramifications on the type of players you can select, perhaps increasing the value of power hitters who don’t necessarily make a lot of contact. In terms of almost every stat, DraftKings penalizes more for negative outcomes and awards more for positive ones. 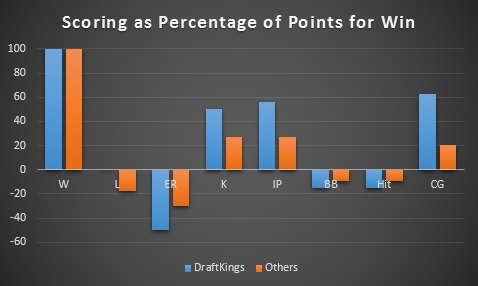 Earned runs, walks, and hits will all cost you more on DraftKings than other sites, but you also get significantly more points for strikeouts, innings pitches, and complete games. This phenomenon increases the value of pitchers by making the top ones scarcer. With more points for positives and more points removed for negatives, the range of potential outcomes for pitchers increases dramatically. A pitcher who goes for a complete game with a bunch of strikeouts can light up the scoreboard, increasing the value of elite options, while a pitcher who tanks can kill your lineup. Also note that DraftKings doesn’t penalize pitchers for losing games. That can aid pitchers on poor teams a little bit; you still want points for the win, obviously, especially since you get so many of them, but there’s still less downside to losing than on other sites. 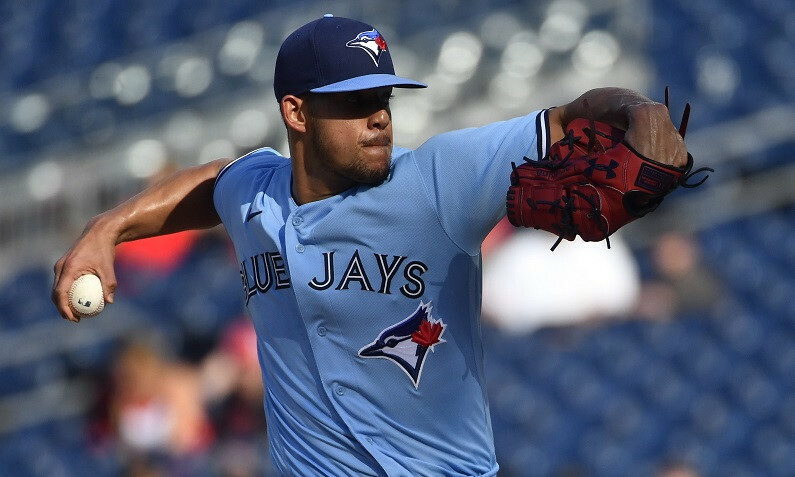 Overall, most experienced daily fantasy players will tell you that they like to pay for pitching on DraftKings, starting with two quality pitchers and building their lineups from there. Some prefer to start with hitters in tournaments, but that’s not always the case and it doesn’t diminish the importance of pitchers in those formats. One of the popular strategies in daily fantasy baseball tournaments is stacking—picking players from the same MLB team in order to increase upside. 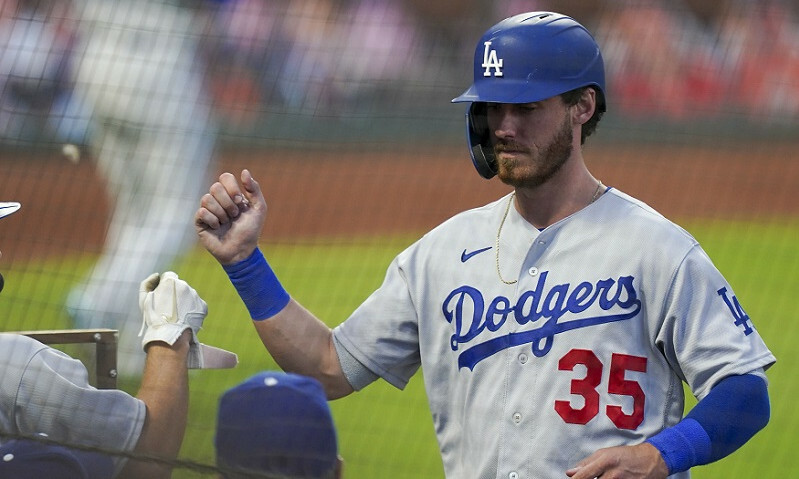 A daily fantasy player might “stack” the 2-3-4-5 hitters from a particular team, for example, to “double up” on points when they have both the hitter and base runners, for example. DraftKings has a slight limitation on stacking in that you must use players from at least three MLB teams in your lineup. However, because of the fact that you start two pitchers, the impact of that rule is minimal. You can still stack your team pretty heavily, if you prefer. There’s really good evidence that stacking is a smart strategy in tournaments. Since you need an elite score to win, you want as much upside as you can get. There’s not as much of a consensus on stacking in smaller leagues, including head-to-heads and 50/50s, but the rules at DraftKings make it easy to do that if you’d prefer. One strategy you want typically want to avoid in the smaller league types is using pitchers who are facing one another. Since wins are worth so much, you never want to put yourself in a position in which the success of one of your pitchers necessitates the failure of the other. The last thing you’d want is for one pitcher to get a loss and the other to see his team’s lead evaporate late, giving him no decision on the night and giving you no wins from two pitchers. 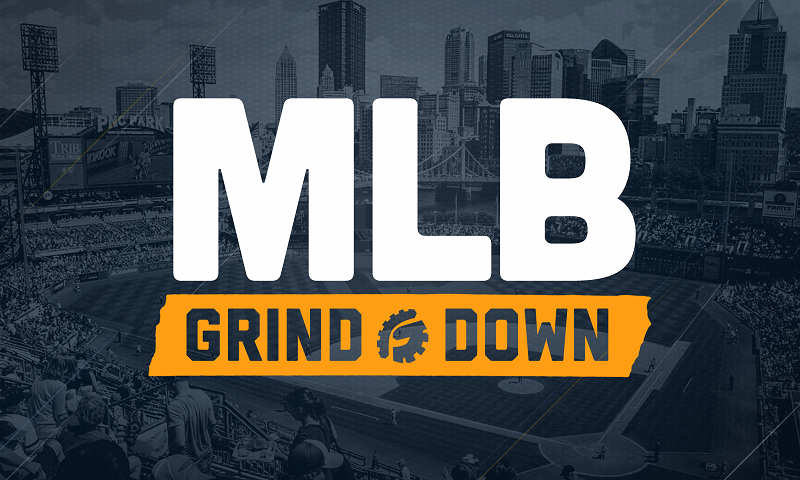 As always, make sure you get our DraftKings MLB Incentives for free by signing up for the site through any of our links, and check out all of the content at GrindersU. 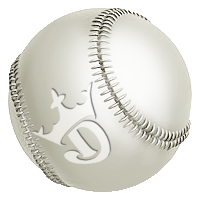 Looking forward to DFS Baseball and I greatly appreciate and commend you on such a comprehensive guide to DFS Baseball Strategy. I’m feeling Confident to take advantage of Vegas Lines, Stacking, High K pitchers with lower WHIP and more Vegas Lines!